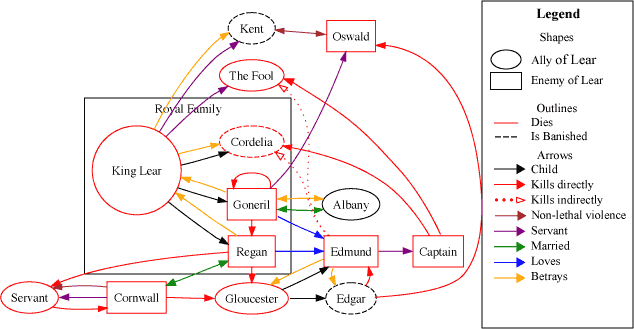 Shakespeare's King Lear, like anything by Shakespeare, has very complex character relationships. This diagram is intended to help readers visualize the play. What follows is a short explanation of how the various characters betray eachother. Lear's excessive pride leads him to banish his daughter Cordelia for not expressing her love for him. His trusty servant Kent attempts to defend her, only to be banished himself. Both Goneril and Regan betray the trust their father bestowed upon them when he entrusted them with his kingdom. They both disrespect him and seek his death. Albany, however, intercepts the letter and so foils her plans. Gloucester is fooled by the deception, and banishes innocent Edgar. Gloucester dilvuges in his son Edmund that the army of France is preparing an invatsion. Edmund betrays this confidence by telling all to the Duke. He explains that by creating the downfall of his father, he will move up in power.